Ever have that geez, what took me so long to find this book? experience? Yeah. 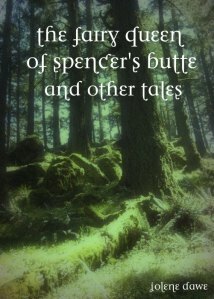 That pretty much sums up my reaction to The Fairy Queen of Spencer’s Butte. I was already familiar with some of Dawe’s short stories, but I somehow managed to miss her collection. Shame on me. I do have a few small critiques. First, the anthology lacks a table of contents (at least in its digital version). A table of contents would have been immensely helpful. Secondly, Dawe’s stories possess a wonderfully fluid (non)linearity, with points of view and events sliding back and forth to create a dreamlike quality. That usually serves to make the story stronger. In a few cases, though, such as “Those Who Guard,” an extra space is not enough to indicate a change in perspective; the use of asterixes or some other symbol to mark the break would have been helpful. Those critiques aside, The Fairy Queen is a wonderful collection. * These thirteen tales are modern myths, in every sense of the word. Highly recommended to fans of CS MacCath, Catherynne M Valente, and Jane Yolen. *Check Dawe’s blog for sales information.